Hello everyone! Hope you had a good weekend and happy Rosh Hashana! This week's post is to show five black-and-white sketches for one of my current school projects. I decided to do a series of graphic motorcycle shirts. I try to do something more unique and different from what I see in the current market, which the image is still and the idea is old. I try to revive some of the images I saw and add some fun and humor to it. Some of you might see this already on my social media, now you can see it all in one page and know my thoughts behind the design. The first idea that came into my mind. My friend suggested to put the engine in between the skeleton's ribs to make it feel more like a heart. The reference is my own bike, a Suzuki TU250X. I love riding it to Long Island for a daily hiking trip. The landscape in the left mirror is Montauk lighthouse and on the right is Breakneck Ridge in Cold Spring. The idea came from my own personal experience. 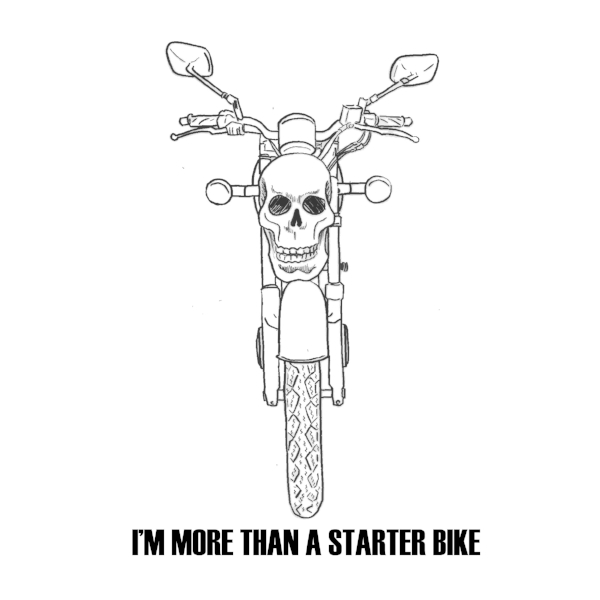 I often hear people say this to me when I introduce my bike. Their thought on smaller bikes is, "they're great for starters." That I agree, but I also want to justify for small bikes, they also can do what many big bikes can't do, which is moving through small spaces. Small bikes are a blast in dense city like NYC. In this design, I want to emphasize the fun adventure a motorcycle can bring. Last one features a female rider cruising on the road under the sunset. I hope you enjoy today's series. If you ever question, "Why skeletons, Jamie?" It's because a while ago I started liking the idea of blurring the lines between sexualities and ethnicities. I don't have to worry about how to depict the character when drawing the skeletons because underneath we're all the same, right?